There is so much about this sweet season of life that I want to have in writing forever. I know I think right now I will never forget this time, but just as I say that-- the memories are gone; replaced by new ones. The new ones are great, welcome memories; but the old ones, oh the the old ones are the ones I want to hold on to forever. I don't want to forget this time; our first year of marriage, our teeny tiny apartment, experiencing the real world, forming new friendships, learning how to maintain the old friendships, the hard times, and the really really good times. I don't want to forget the promises from the Lord that we have already seen come to fruition, and the promises that we are believing for our future. I don't want to forget seeing my husband handle hard situations with so much grace and setting the precedent in our marriage for how we respond to difficulties. I don't want to forget the faces and names of the people that come and go from our tiny apartment as we pray that we can in some small way make an impact on their lives forever. I don't want to forget staying up late at night watching Brian study or write an order with a smile on his face (because the guy is the most joyful person I know) after he has been awake for far too long. I don't want to forget how much I miss him when he is gone for weeks at a time; and how I hope I always miss him this much. I don't want to forget the brown chair, where we sit and talk about life and laugh and watch the shows we love together. I want to remember it all; the insignificant and the important. And so: a blog has been born. Can't tell you how pumped I am for this blog Mckenz! So proud!! 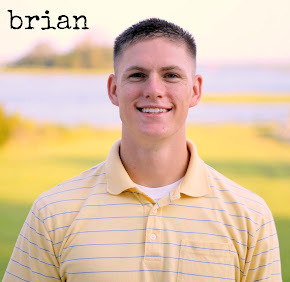 You have a gift for writing and I will so treasure being able to keep up with your and Brian's life! This is beautiful. You're lucky to have each other- and so many will be lucky to know you in tiny apartments or anywhere else. What a sweet post! Love your pics, you guys are seriously too cute. Yes!!!! So excited. Write on and I'll be ready to read every post! This makes me so incredibly happy and excited! It reminds me of when we were in Ghana and how much I always looked forward to reading your next entry and how the world fell in love with your writing - as it transported them to experience your world and things they might not have been able to experience themselves. Loving you and missing you, little sis.